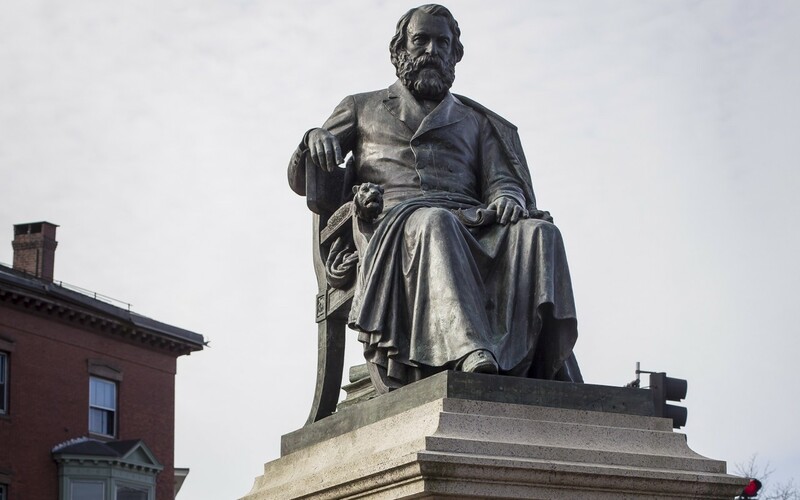 The cast-bronze Henry Wadsworth Longfellow Statue was commissioned to memorialize Portland’s native son and America’s most famous and beloved 19th century poet. Portland-born sculptor Franklin Simmons, one of the nineteenth century’s leading sculptors, created it in his Rome, Italy studio and it was dedicated September 29, 1888. 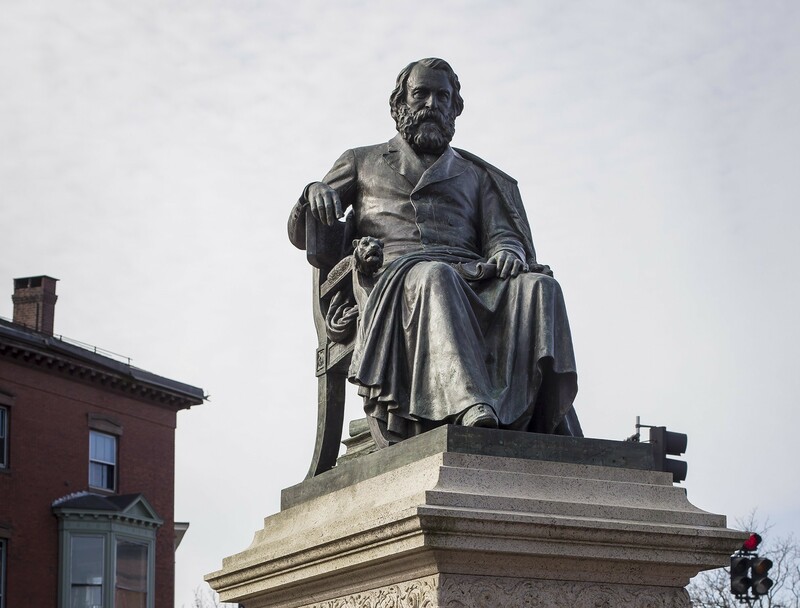 The sculpture is a portrait of a bearded Longfellow, seated with his right arm resting on the back of his chair, holding a scroll in his lap with his left hand. Three bronze books are placed under his chair. 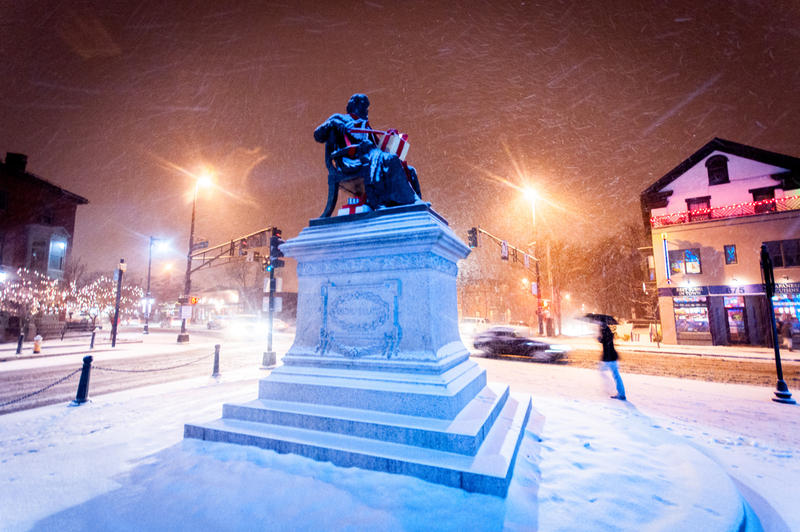 He is seated casually facing the city center and when the holiday season approaches, Longfellow is inevitably found holding a wrapped present. The rectangular granite pedestal was designed by Portland architect Francis Fassett, and fabricated by the Hawkes Brothers. 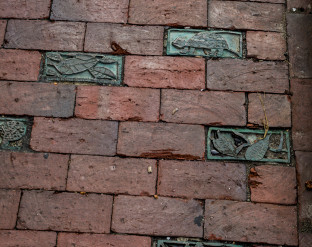 Funds for the monument were collected by members of the Longfellow Statue Association, and from pennies, nickels and dimes collected from children around New England. Their names are in a sealed container in the pedestal’s base. 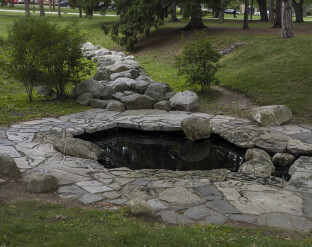 The total cost of the sculpture was $17,000, and the base was a gift of PaysonTucker, vice president and general manager of the Maine Central Railroad. The monument was added to the National Register of Historic Places in 1990. The Square itself is surrounded by 19th century buildings, most of which were built as homes before being converted to commercial use by the 1920’s. Originally, State Street passed on both sides of the statue. In the 1970’s, a landscaped pedestrian area on the east side of the statue was created, and traffic restricted to the west side. 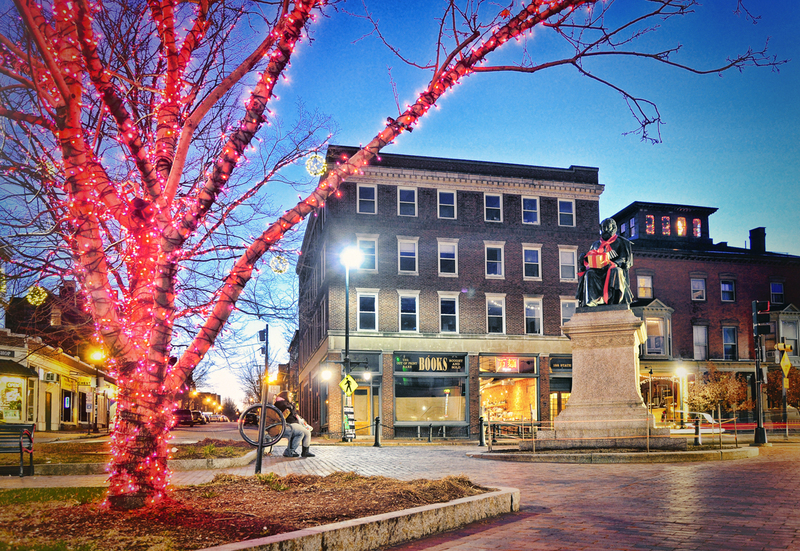 In 2005 the square was redesigned to create additional pedestrian space and landscaping. Art in Our Front Yard Longfellow Statue from Portland Public Art Committee on Vimeo.